Before we can understand digital photography-related Photoshop topics like image resolution and bit depth, and before we start editing and printing our digital photos, we need to grab our virtual microscopes and magnifying glasses and examine the tiny, often times completely overlooked world of digital image pixels. The word "pixel" is really a short form of two words, "picture element". It's an appropriate name, since pixels are in fact the elements which make up our digital pictures. Pixels are the building blocks of any digital photo or image, sort of like how those fancy Lego toys they sell at your local Toys R Us are really nothing more than a collection of small, individual Lego pieces, or how pieces of a jigsaw puzzle come together to form a complete picture, yet if you're standing close enough to the puzzle, you can still see the individual pieces. Pixels make up your digital photos and images in much the same way. When you look at a digital photograph on your computer screen, even though it looks like a normal photo and you can clearly make out the people and/or objects in the photo, what you're really seeing is nothing more than a massive collection of colored squares, squares that are normally too small for your eyes to see them individually, yet when placed side-by-side and above and below each other, they form a complete image, which is the photograph you're looking at on your screen. What you see as a photo you took using your digital camera of your family or a recent trip, a sporting event or whatever the case may be, is really nothing more than a whole bunch of tiny colored squares. Don't believe me? Let's prove it then. Above is a photo I took with my digital camera while walking through the Butterfly Conservatory in Niagara Falls, Canada. It looks like, well, a photo of a butterfly, right? 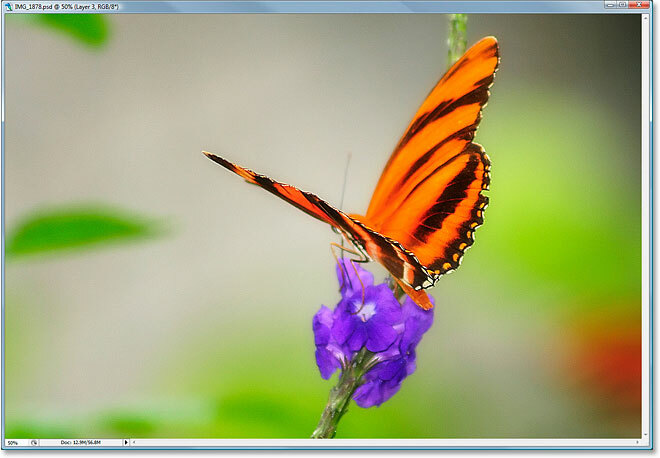 But is it really a photo of a butterfly? Take a look at the screenshot below and tell me if it looks like a butterfly to you. The same photo zoomed in to 1600%. 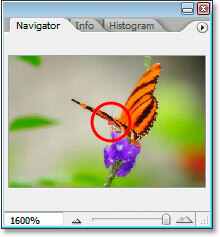 The Navigator Palette shows us that we are in fact looking at the photo of the butterfly, and what we're actually looking at is the butterfly's eye zoomed in at 1600% magnification. At this level of magnification, the image doesn't look anything like a butterfly, and is quite obviously nothing more than a collection of colored squares. These squares are the pixels, and it's these pixels that Photoshop sees and cares about. Photoshop doesn't care what the subject of the photo is supposed to be. It doesn't know what your family looks like, what your dog looks like, what the lake near your cottage looks like, or even what this butterfly looks like. All Photoshop knows is pixels. 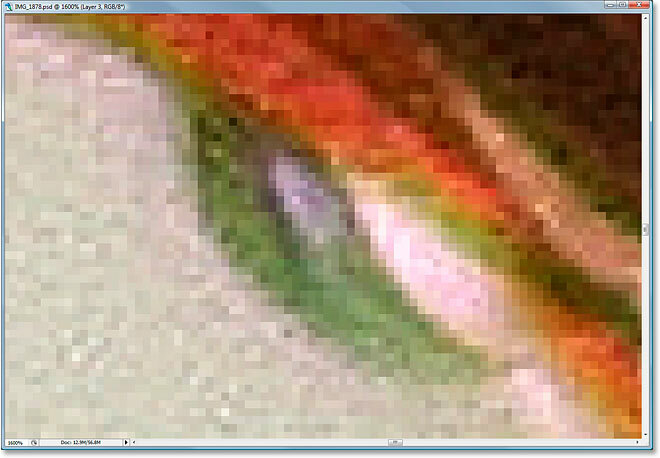 You may have noticed in the zoomed-in screenshot above that each individual pixel contains only one color. Some pixels may appear to contain different shades of that one color near their edges, depending on the color of the pixel next to it, but that's just your eyes playing tricks on you. Seriously, it's an illusion, yet it's an illusion caused by a whole other topic on color which we won't get into here. All we need to understand for now is that each individual pixel uses exactly one color, and it's the color of the pixels that we're changing whenever we edit our digital photographs in Photoshop. Also, it's the variations in color and brightness values of the individual pixels which gives us what we see as image detail in our photos. We'll look more at these topics as we go along. I just wanted to give you a sense of how incredibly important these image pixels are, especially since we're going to be changing their appearance, for better or for worse, when working on our images in Photoshop. To summarize then, pixels, short for "picture elements", are tiny colored squares which all digital photos and images are made up of, whether they're from your digital camera or your scanner. In the next section, we'll take things a step further and look at image resolution.